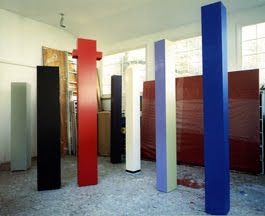 Anne Truitt , the great artist, sculptor, teacher, author, mentor….will have a retrospective of her work @ the Hirschhorn Museum of Art: Anne Truitt: Perception and Reflection: October 8, 2009 to January 3, 2010. It gives me a formal opportunity to thank her for her help in shaping my work/ process and to share with others who don’t know about her contribution not just locally in Washington DC, but Art in general in the 20th century and beyond. The Washington Post has written 2 articles about her here and here and I just found this from Smithsonian.com. I met her while I was a student at the University of Md. 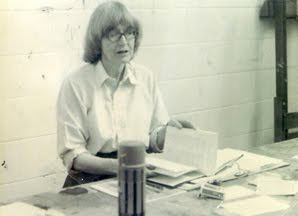 She was an iconic figure there and people, both teachers and students alike, felt fortunate to be included in her orbit. Sometimes I would carry her school bags to her car. She was well regarded not just because of what she had already done and was doing but also because she could speak personally about a profession like Art. She made Art accessible and we believed her. She was true to the dialectic. We never felt patronized. She spoke with us about subjects around and above us. Her discussions focused less on our art work and more in the quality of our convictions in the work: the technique which allowed the truth of it, not the paintbrush or chisel. She just wanted it to work. In my last year at the University I asked her to be my thesis advisor. She said she had stopped taking anymore students and besides I already had a commitment to a point of view: stone sculpture. Would studying with her be helpful? 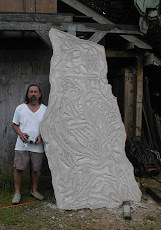 My carving teacher Ken Campbell had just retired and I told her frankly she was the only one in the faculty who understood what I wanted to understand. She asked me about stuff and I couldn't answer her, the words just stumbled one after the other until finally I gave up. She said not to worry, she would help. What was important was that it was in the air. My job was to stay sensitive to it and that I would get it later.